Tomorrow Novosibirsk will celebrate Day of protection of children, celebrations will cover the entire city. June 1 the men of the day free invite to the zoo (part time) and petting zoo (all day). Interesting program with three puppet shows, and artifacts from the Park “Galileo” will be in the first square, and Central Park will be officially opened by children’s railway. If it rains, he can take refuge in a shopping Mall — one of them will sing contestant on “the Voice. Children.” Details — the selection of festive events from NGS. Start celebrating children’s Day today, may 31: in the first squarefrom 14:00 to 19:00 is a summer family festival. Here is a charity photo shoot with dogs and sports. The organizers promise workshops from experts on family relations, games with prizes, a huge coloring book and a movie on the grass. 1 June will open a new season of children’s railway. At 10:00 at station Sports in Zaeltsovsky Park will start operating the rides, the entertainment and sports fields. Will the concert program with participation of collectives DKJ. The opening ceremony itself will be held at 11:00 and 12:00 the station will go on the first train. On this day, children up to 14 years will be free, but for an adult ticket will have to pay 200 rubles. At 10:30 in the recreation center “Academy” (Lenin, 4) the theater of “a Clockwork orange” free will show children’s performance “Honest pig” based on the famous cartoon about a Pound. And if the weather does not disappoint, a small representation of the suit and on the street. A big feast is organised on 1 June at the zoo (from 11:00 to 14:00 children up to 16 years will be able to get there without a ticket). At 11:00 near the main entrance will act creative teams. At the same time, the Dolphinarium will open the interactive pad and at 13:30 here is the start of the final vocal competition “Be a voice”. At 14:00 on the Central square will award the participants of children’s competition “the Red book of the Novosibirsk zoo animals”. From 15:00 to 20:00 will go to the concert. On the Central alley of the zoo and the scene will place the gaming zone with quizzes, contests of skill and acting training. There will also be animators working in animal costumes. Another area will be themed alleys with workshops and lectures (for example, you can learn about how to carry children in a sling, and participate in the quest, “Boring history”). Animal lovers should go to the petting zoo “Forest Embassy” (Dusi Kovalchuk, 179/3): June 1, children under 10 years old are invited for free (accompanied by an adult and upon presentation of proof of age). An adult ticket costs 250 rubles. Throughout the day (from 10:00 to 20:00) can be photographed with an owl, a Fox and rabbits, and at 14:00 and 18:00 to participate in the workshop “Feeding and caring for carnivorous plants”. Cinema“Victory” on June 1, established a special ticket price — 100 rubles — for the animated film “Sadko” and “Two tails”, the documentary “Earth: one amazing day”, the Comedy “the Dogs under the guise of” film “Peter Rabbit” (all tapes — 6+) and the family fantasy “the Last hero” (12+). Each viewer promise popcorn as a gift, and the lobby will hold contests, workshops and games. In addition, 1 and 2 June, you can go to the festival of German films for young viewers”, Szlengel in Novosibirsk”. In the “Victory” will show movies with the translation that will be released in Russia. 1 June 11:00 festival opens the tape, “Tim Thaler, or Sold laughter” (6+) — viewers will be able to communicate with the Director of the project “Slinger” Michael Harbauer. At 14:00 will start the film “At eye level” (12+). June 2 12:00 show picture “to Save Raffi” (6+) and “schönefeld Boulevard” (16+, viewers will meet with leading lady Julia Andrasek). Tickets cost 100 rubles. On the first square 1 June organize annual charity festival “Festival of dolls”. At 12:10 on the main stage performance of “play with us” will show regional puppet theater. At 13:20 artists team “Dolls are laughing” play the tale “Kolobok”. And at 15:10 puppet theatre at the CDC of a name of Stanislavsky will show performances from the cycle “Children’s tales”: “the hedgehog and the hare” and “Two greedy mouse”. On this day in the first square will appear exhibits “Galileo Park”, robots, trampolines and Board games. Also, viewers will be able to communicate with animals from the zoo, to appreciate the skill of juggling school UP! and other talented Novosibirsk. The site will be open until 17:00, admission is free. There will be small concerts in other green areas of Novosibirsk. For example, in the Central Park program with contests and prizes will begin at 12:00, in Zaeltsovsky Park at 14:00, in Bugrinskaya grove is at 16:00. Holiday “kick off to summer” will take place from 14:00 to 18:00 at the library. On an area of over 500 square meters will accommodate gaming and entertainment areas, and on the stage will give a performance with the theatre actors of the city. Also in the programme: workshops, a food court, a performance of stilt-walkers, science shows and other free activities. June 1 you can go to the theatre at the Globe, at 14:00 will show the play“King Matt” (12+). This is a story about a little Prince who has to take the throne and to participate in the war. But his main goal is to make everyone around happy. Tickets for the performance are 250-350 rubles. The loft-Park “Subway” (the Red prospectus, 161) 17:00 the guys from school “Mandarin” will show an interactive performance based on the game “Jumanji” for children from seven years. Tickets cost 300 rubles. 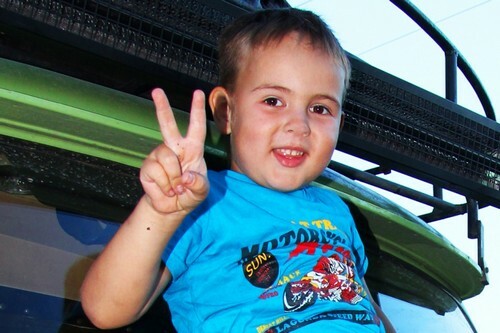 The money will be directed for treatment in China small Novosibirsk Egor Solovieva who is struggling with a serious illness. The two-hour program called “Start of summer star” has prepared a Large Novosibirsk planetarium (beginning at 21:00). Offers lecture-a walk in the starry sky, a visit to the Observatory and familiarity with optical equipment, master-class on work with night-vision goggles, the lesson-experiment “Mysteries of the black hole”, a mini-lecture on Jupiter, astronomical interactive games, children’s workshop “learn the Solar system”, astronomical observations through telescopes (weather permitting). The highlight of the program — view the fulldome film “From the Earth to the Universe”. Tickets cost 350 rubles 180 rubles (for children), and can be reserved by phone 347-77-07, 347-77-11. Events will be held in shopping malls of the city. 1 June 16:00 to 19:00 in “Aura” children will be entertained by animators (including the hero of the movie “transformers” Bumblebee). In MEGA celebration will last three days — 1, 2 and 3 June from 10:00 to 22:00. In the program family festival: master classes and lectures, performances of the skaters at the rink, drawing strollers, shows, dance groups and students of music studios. TCS also organize the display of children’s clothing from the Siberian designers and equip a bright photo zone. In the shopping center “Gallery of Novosibirsk” will be fun, June 2 from 10:00 to 22:00. Offers balloons, Board games, photo zone with instant print pictures, animators in costumes of superheroes and wizards to create small miracles. Children will be handing out cotton candy. From 12:00 to 18:00 you can participate in master classes on origami, making weathervanes and toys. On stage there will be contests and games, interactive theater, silver show, the numbers of the guys from pop the center “father’s children” and the dance Studio Dimirano. And at 15:40 will act as the participant of the TV project “Voice. Children” Anastasia Perchikova. TRK “Eden” in the campus invites for the event on 2 June at 15:00 in addition to the concerts in the food court area will be master-classes on painting cakes and assembling weapons. The wizard will make everyone face painting, and kids will enjoy puppets. June 2 will be a big celebration in the Park “Birch grove”, which was organized by charity Foundation “Live.” At 12:00 will begin a six-hour concert of creative collectives of Novosibirsk. Parallel conduct various master classes (Taekwondo, modeling, painting, soft toys making and other creative arts). The Park will operate child psychologists. Everyone (regardless of age) will play in a giant TIC-TAC-toe and will make a photo for memory in the rock-photo zones with motorcycles. The holiday will end at 18:00 fire show with pyrotechnic effects. Any day until the end of September you can go with the children to an interesting exhibition inthe”Center of history of development of Leninsky district” has collectedSoviet toys (oldest doll almost 70 years). Playground is open from 10:00 to 19:00 (lunch from 13:00 to 14:00) to the address: street Parhomenko, 8. Entrance to the exhibition is free (0+). The last time the city’s residents called for mass street venues and cultural institutions in the “Night of museums”, which took place from 19 to 20 may, about the most interesting moments of the action read the report of NGS.